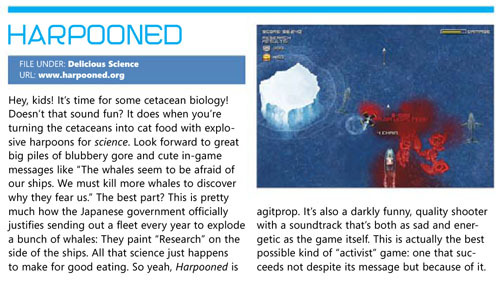 Harpooned was featured in Games for Windows Magazine. Harpooned is also in this month’s PC PowerPlay (Australia). Want to know what sort of research the Japanese scientists are doing with all those dead whales? How about attempting to create cow/whale mutant hybrids! Imagine the size of the steaks you’d get from one of those! The conclusion of the experiment: “Blastocyst formation was only observed when bull spermatozoa were used.” Unfortunately they failed to create any viable cow/whale mutant hybrids. I wonder if they’d eat grass or krill? Thanks to Steve Jackson for the link.